This blog post is an update for the OSHWA community about the 2019 Open Hardware Summit in Shenzhen, October as Open Hardware Month, and how OSHWA will think about Summits going forward. OSHWA will shift the Summit to the spring starting in 2020. The Summit will also be held in the same city for at least 3 years starting in 2020. There is a lot to unpack here, so let’s get to it. At the end of the 2018 Summit OSHWA announced that it would be holding the 2019 Open Hardware Summit in Shenzhen, China. Shenzhen has a vibrant local community of open source hardware enthusiasts. Many members of the OSHW community were also very excited for the opportunity to travel to a location that is so central to manufacturing innovation. Unfortunately, in 2017 China implemented a law governing the activities of non-Chinese NGOs operating in China. This law created a number of bureaucratic hurdles for organizations like OSHWA that were interested in holding events in China. Among other things, the law requires OSHWA to find a local Chinese Partner Unit (CPU) willing to act as our sponsor for the Summit. CPUs can only be certain types of organizations, such as universities or registered Chinese NGOs. Companies cannot serve as CPUs. The CPU must also be willing to undertake a significant number of bureaucratic steps to officially register the event and coordinate with local authorities. In addition to the process required of the CPU, OSHWA itself would have to undertake a significant and burdensome number of steps to collect, verify, and provide paperwork to Chinese authorities (see this article “Reams of Paperwork: Preparing Documents to Get Official Status in China” and the checklist we prepared here for a sense of what is involved). OSHWA has spent the last few months trying to identify a suitable CPU. We have been unsuccessful, and do not have confidence that we will be successful in the future. Furthermore, even if we were able to find a suitable CPU, OSHWA cannot justify the time and resources required to comply with the various filing requirements associated with the law. As a result, OSHWA decided that it was better to cancel the 2019 Summit now, before speakers and attendees had made commitments and travel arrangements. That being said, OSHWA is still committed to supporting the OSHW community. That is why we are pairing this announcement with two additional announcements. OSHWA has traditionally supported October as Open Hardware Month. Open Hardware Month is an opportunity for the community to hold local events, hackathons, and documentation days as part of an international movement. OSHWA wants to take this opportunity to expand Open Hardware Month events. We will work to provide resources for the community to create to local events, aggregate information to make it easy to find events in your area (or know that you need to organize one), and collect stories, video, and images of the events as they occur. These events will not be OSHWA run or carry the formal OSHWA name. We believe that Open Hardware Month will provide us an opportunity to shine a light on open source hardware events happening around the world. It will also provide an opportunity for local communities to raise their hand and be recognized by the global OSHWA community. Please email info@oshwa.org to learn more and volunteer to be involved. Cancelling the Shenzhen Summit and focusing on Open Hardware Month will also allow us to shift the Summit to the spring. Over the years a number of Summit participants have told us that the spring is generally less crowded with events and obligations, so this shift should make it easier for more community members to attend. Starting with the 2020 Summit OSHWA also intends to commit to a single US host city for at least three years. For the past year the OSHWA board has been debating two alternative paths for the Summit. The first path would continue the pattern of moving the Summit every year. The benefits of this path is that it allows the Summit to come to the many different communities that support OSHW. The costs of this path are that it makes the Summit more expensive to operate because OSHWA needs to spend time and resources learning a new city every year. Switching cities also makes it hard to capitalize on the enthusiasm of local attendees in order to convert them into full community members. Conversely, the alternative path is to commit to a single city for multiple years of the Summit. The benefits of this path is that it allows OSHWA to run the Summit significantly more efficiently and makes it easier for community members to plan. Holding the Summit in a single city allows OSHWA to grow the number of attendees by turning opportunistic local attendees into more permanent members of the community. The cost of this path is that it prevents us from moving the Summit to all of the communities that support OSHW. After significant discussion, OSHWA has decided to adopt the single city approach. This decision was easier because we paired it with the expanded Open Hardware Month. We believe that Open Hardware Month will help fill at least part of the gap created by a stationary Summit. While none of these decisions are being made lightly, OSHWA believes that combined they allow us to create a rhythm that is more supportive of the vibrant OSHW community. Open Hardware Month in the fall will shine a spotlight on all of the local OSHW communities around the world. The Summit in the spring will provide those communities a single place to come together and meet in person. As always, OSHWA exists because of its community and we want to hear from you. Please let us know what you think in the comments below or in the forums. From OSHWA’s standpoint, it does not really matter if the patterns on Curver’s and Home Expressions’ baskets are the same or not. What is important is that Curver’s patent is for the design embodied in chairs and baskets are not chairs (feel free to post your chair-basket venn diagrams in the comments). Curver should not be able to select arbitrarily or strategically the thing that embodies its design in order to get the patent, and then turn around and apply the patent well beyond the scope of that selection in the real world. Our brief asks the court to adopt a rule preventing that kind of behavior. After almost a year and a half of community discussion, OSHWA unveiled the Open Source Hardware Certification Program at the 2016 Open Hardware Summit. Today, with the help of a major grant from the Sloan Foundation, we are excited to announce that we are taking major steps towards Certification 2.0. The original certification program has some fairly straightforward goals. It is designed to make it easy for creators to identify their hardware as compliant with the community definition of open source hardware, as well as make it easy for users to know that hardware that is advertised as “open source” meets their expectations. The certification process gives a creator confidence that they have done everything required to call their hardware open source. The certification logo gives users confidence that they will be able to access, build upon, and hack any hardware that they receive. We didn’t know what to expect when we launched the certification program and have been blown away by the results. There are currently 170 certified hardware projects from 18 countries on 5 continents participating in the program. While we are excited about the certification program, shortly after it launched we started thinking of ways to improve it. The current interface built on a combination of google forms and wordpress is functional, but not necessarily elegant. Once the process was live, we also started getting feedback from users on ways to make it better. One major concern was that the registration process exists in a bit of a vacuum. It asks the creator to verify that she has complied with all of the requirements but does not provide very much guidance on the best ways to comply or the various choices that can be made and still comply. For the past year we have been working with the Technology Law and Policy Clinic at the New York University School of Law to create more robust guidance to help creators navigate the licensing, documentation, and other decisions that creators must make when they are working towards certification. We have also been working with the team at Objectively to turn that guidance into an interactive process that draws on examples from the community. The grant from the Sloan Foundation allows us to take that work and turn the certification into a much more robust and useful resource. We are hoping to have the new site ready to launch by the 2018 Summit. Until then, please let us know if you have thoughts, ideas, or concerns. We are very excited about the next chapter of the Certification Program and hope you will be too. Today the Open Source Hardware Association is excited to announce the OSHWA Open Source Hardware Certification program. The program allows hardware that complies with the community definition of open source hardware to display a certified open source hardware logo. It will also make it easier for users of open source hardware to track down documentation and more information. You can check out the program here, and keep on reading for some information about how it will work. These companies and organizations have agreed to certify at least one piece of hardware by the end of this year. 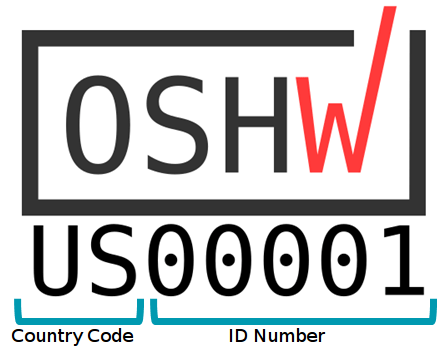 Almost a year and a half ago, OSHWA announced its intention to explore the creation of an Open Source Hardware certification. At that point, the open source hardware community had created a community definition of open source hardware and the open source hardware open gear logo. Both of these were significant contributions to the growth in awareness around open source hardware. 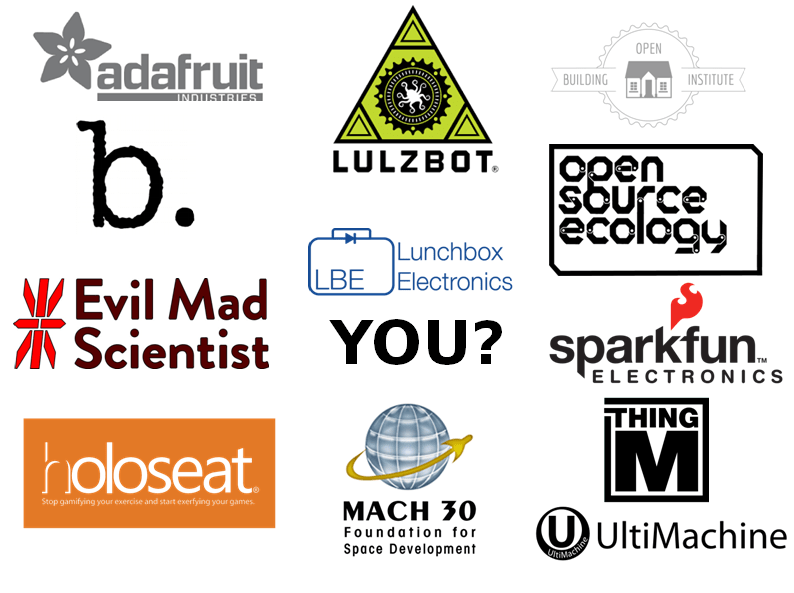 By design, no one owns the term “open source hardware” or the open gear logo. This allowed both the term and the logo to be widely adopted by the community. However, it also created a challenge. In many cases, creators would label their hardware as being open source and use the open gear logo without complying with the community definition. This created confusion in the community where users were unsure what it really meant when something was labeled “open source hardware”. The certification is designed to complement the existing open gear logo by bringing clarity to how the creator is using the term “open source hardware”. Unlike the open gear logo, the certification logo is controlled by OSHWA. In order to use the certification logo, a hardware creator must make a legally binding promise that their hardware complies with the community definition of open source hardware. That means that when users see the certificated open source hardware logo they know the hardware complies with the community definition of open source hardware. In the summer of 2015, OSHWA asked the community a number of questions about how a certification might work and what kind of value it might bring. By the 2015 Open Hardware Summit, those discussions had coalesced around version 1 of the Open Source Hardware Certification Specification. In the year since, OSHWA has worked with the Juelsgaard Intellectual Property and Innovation Clinic at Stanford University Law School to turn that specification into a fully functional registration system. Starting today, you can register your hardware for free by certifying that it complies with the community definition of open source hardware. The registration site – certificate.oshwa.org – has an overview of the process, the text of the license agreement for use of the certification logo, guidelines for how the logo can be used, a history of the certification process, an FAQ related to the certification, a form that allows you to register your hardware, and a directory of registered hardware that includes links to relevant documentation and information. Upon registration, you will receive the right to use the certification logo and a unique identifier for the registered version of your hardware. That unique ID has two components. The first two characters represent a country code. Open source hardware is a worldwide community, and the country code is an opportunity to recognize and celebrate that fact. The remaining characters are numbers assigned sequentially based on when the hardware was registered. One of the critical elements of the certification process is the idea of the creator contribution. Hardware often involves many third party components outside of the control of the designer. Therefore, it is unreasonable to require every component of a piece of hardware to be fully open before becoming certified. The creator contribution rule is an attempt to address this issue. In order to certify a piece of hardware, the creator must fully open any elements of the hardware that is within their control. If they have the legal ability to license it, it must be licensed openly. If they created documentation, that documentation must be freely distributed. If components were created by third parties, the creator does not have the ability to license them or distribute the documentation. In those cases, the creator merely has to disclose the parts in the bill of materials and certify that they are available without an NDA. This system allow creators to distribute legitimately open source hardware without creating a (currently) unrealistic burden to find fully open components. OSHWA has designed this process to be as user friendly and straightforward as possible. However, it does require users of the certification to make a legally binding promise that they will only use the certification logo on hardware that complies with the community definition. We recognize that this sort of legal promise can raise concerns or cause uncertainty for some community members. Therefore, we encourage users to write in to certification@oshwa.org with questions. While OSHWA will work hard to answer as many questions as possible, some questions may require legal advice. That is why we have partnered with the Cardozo Law School Tech Startup Clinic. The clinic has agreed to receive referrals from OSHWA for free and low-cost legal advice regarding the certification process. We hope to add additional clinics and resources to this program in the future. (If you are a lawyer who would like to be involved with the referral program, please contact us at certification@oshwa.org). Ever since we started discussing unique IDs that were sequential, we’ve gotten variations of a single question: “how can I get a low number?” In order to give as many community members as possible the opportunity to obtain a coveted low unique ID number, we have decided not to start issuing numbers until the end of October. All hardware registered before the end of October will be combined into a single pool, from which we will issue IDs starting November 1. That means that all pieces of hardware registered before the end of the month have an equal opportunity at low registration numbers. Starting November 1, we will start issuing IDs as hardware is registered. 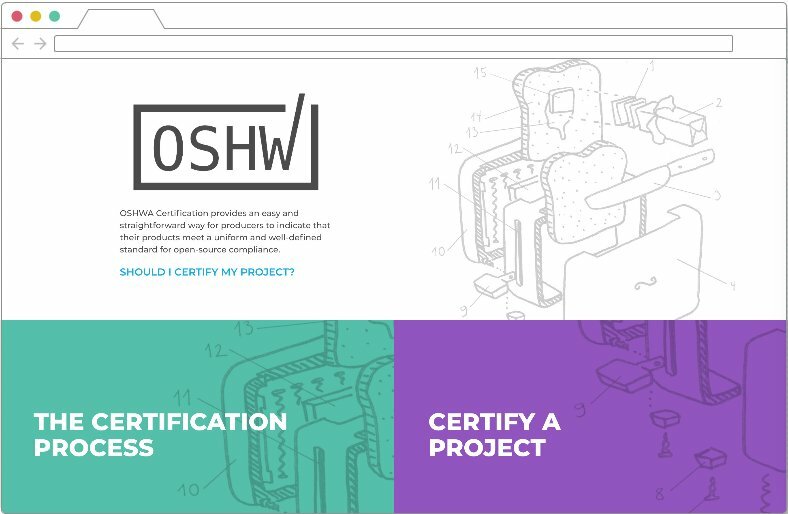 This is the first version of the OSHWA Open Source Hardware Certification program. It was designed with a great deal of community input and is intended to complement existing pillars of the community. We hope that you take a look, try it out, and find it useful. At the same time, we know that as the certification program grows we will find things that can be improved and applications that we failed to anticipate. That’s why we welcome your thoughts and ideas in the comments of this post, in the forums, in the certification@oshwa.org inbox, and online @OSHWassociation. In order to provide that feedback, you first need to check out the certification. So stop reading this blog post, click on over to certificate.oshwa.org, and register something! Don’t have anything documented enough to register? Bring a project to one of the Documentation Days around the world (or host your own) as part of Open Hardware Month so you can make it easier for people to build on your stuff.